A complete kit of parts to help protect a basement area or other vulnerable area in the home from unexpected water leaks. Including a LeakStop alarm panel, connection cables, 3 metre sensor tape and 28mm (1″) shutoff valve. 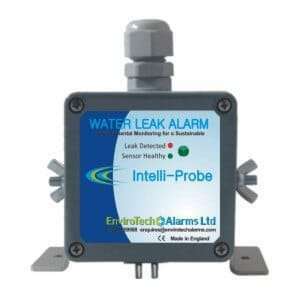 Protect your basement from water leaks using the Basement Water Leak Detector package from Envirotech Alarms. Everything needed to detect the presence of water, alert you to the problem and automatically switch off the water supply is included. Give yourself peace of mind that should a pipe burst or a fixing fail in the pipework, your basement will not flood. 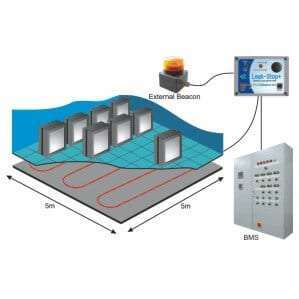 Using the very latest sensor tape design, to detect the presence of water in unwanted areas and set off the alarm panel immediately, this easy to install, easy to use system has been made especially to go into basements and other areas in the home where a water leak would be costly and destructive. 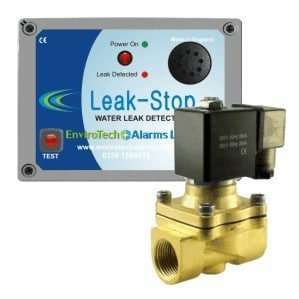 The package includes a LeakStop alarm panel, connection cable, sensor tape and a shutoff valve. 28mm (1") normally open 230VAC solenoid valve used to switch off the water supply to the basement. 3 meter length of water leak detection sensor tape with moulded plug and socket. Designed to detect the presence of water at any point along its' length.